Collection included very sad, dramatic, nostalgic, melancholic, emotional, touching and sentimental music tracks. This track is perfect for films, documentaries, podcasts, advertising, commercials, sad projects, YouTube, Vimeo videos and more. Music very good technical and aesthetic quality. By buying this music package, you will save 50% of their funds, compared with the separate purchase of these lovely tracks. I want to introduce you to my new music track “Soft Drama”. Sounds like: piano, dramatic, piano thoughtful, quiet, very sad, touching and emotional piano, music that can be heard and used in various type of productions: dramatic films, sad videos, documentaries, media projects, broadcast, promo video, advertising, promotion YouTube and Vimeo, for product video. 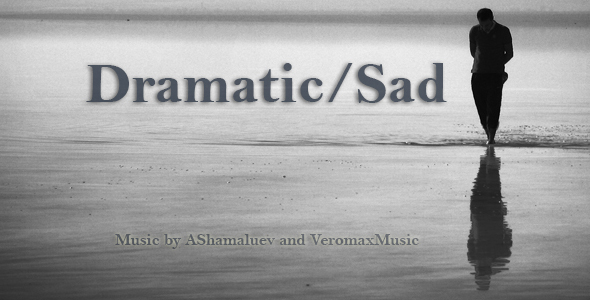 "Soft Drama" is very dramatic piano with the addition of cello and strings, double bass. Music evokes a sense of separation, despair and loss, loneliness. Music is very dramatic, emotional, sad, nostalgic, touching, melancholy, despair, sadness, tragic, calm, dreary, soft, mellow, sentimental. This track is perfect for your projects: for dramatic films, television, documentaries, advertising, commercials, podcasts, for sad projects, YouTube, Vimeo, Dailymotion videos and more. Music very good technical and aesthetic quality. Music by AShamaluevMusic and VeromaxMusic. "SAD" is very dramatic piano with the addition of strings and staccato. Music evokes a sense of separation, despair and loss, loneliness. Music is dramatic, emotional, sad, nostalgic, touching, melancholy, despair, sadness, tragic, calm, dreary, soft, mellow, sentimental. This track is perfect for your projects: for dramatic films, television, documentaries, advertising, commercials, podcasts, for sad projects, YouTube videos and more. Music very good technical and aesthetic quality. Instruments: piano, strings, viola, violin, staccato, bass. Music by AShamaluev and VeromaxMusic. I want to introduce you to our music track “Melancholy”. Sounds like: piano, sad, dramatic, nostalgic, calm, quiet, music that can be heard and used in various type of commercials, sad videos, media projects, dramatic films, broadcast, advertising, YouTube, Vimeo, product videos, promo and more. "Melancholy" is very sad and dramatic piano with the addition of strings and violin, cello. Music evokes a sense of separation, despair and loss, loneliness. Music is dramatic, emotional, sad, nostalgic, touching, melancholy, despair, sadness, tragic, calm, dreary, soft, mellow, sentimental. This track is perfect for your projects: for dramatic films, television, documentaries, advertising, commercials, podcasts, for sad projects, YouTube videos and more. Music very good technical and aesthetic quality. "Drama" - Very dramatic and sad piano and strings with the addition of pizzicato. Music is dramatic, sad, sentimental, dreary, melancholic, calm, mournful, mellow, nostalgia, peaceful, quiet, remembrance, sadness, dilatory, serene, smooth, soft, soothing, touching, tranquil. Music is associated with loss, separation, tragedy. This track plunges into a sad, melancholic, nostalgic and very dramatic mood. This track is perfect for dramatic films, advertising, commercials, documentaries, for YouTube videos, slideshows photos, for sad projects, podcasts and more. Music very good technical and aesthetic quality. I want to introduce you to our new sad music track. Sounds like: piano, beautiful, touching piano, sad, melancholic, thoughtful piano and strings, quiet, very calm, music that can be heard and used in various type of productions: dramatic films sad videos, documentaries, media projects, broadcast, advertising, promotion YouTube, for product videos. Music by AShamaluev and VeromaxMusic. "SADNESS" is very beautiful sad piano with the addition of strings. Music evokes a sense of sad, melancholy, nostalgia and loss. Music is associated with the loss of a loved one, a failed love, grief, struggle over the disease. Music is dramatic, sad, nostalgic, touching, melancholic, despair, emotional, sadness, tragic, thoughtful, calm, dreary, soft, mellow, sentimental. This track is perfect for dramatic films, television, documentaries, advertising, commercials, podcasts, for sad projects, YouTube videos and more. Music very good technical and aesthetic quality. I want to introduce you to my sentimental music track. Sounds like: piano, beautiful, touching piano, sad, melancholic, thoughtful piano and strings, quiet, very calm, music that can be heard and used in various type of productions: dramatic films, sad videos, documentaries, media projects, broadcast, advertising, promotion YouTube, for product videos. “Loneliness” is very beautiful sad piano with the addition of strings and viola. Music evokes a sense of sad, melancholy, nostalgia and loss. Music is associated with the loss of a loved one, a failed love, grief, struggle over the disease. Music is dramatic, sad, nostalgic, touching, melancholic, despair, emotional, sadness, tragic, thoughtful, calm, dreary, soft, mellow, sentimental. This track is perfect for dramatic films, television, documentaries, advertising, commercials, podcasts, for sad projects, YouTube videos and more. Music very good technical and aesthetic quality. I want to introduce you to my new music track. Included 3 versions, plus 43 – second version. Sounds like: piano, beautiful, touching piano, sad, melancholic, thoughtful piano and strings, quiet, very calm, music that can be heard and used in various type of productions: dramatic films sad videos, documentaries, media projects, broadcast, advertising, promotion YouTube, for product videos. “Sad Piano and Strings” is very beautiful sad piano with the addition of strings and violin. Music evokes a sense of sad, melancholy, nostalgia and loss. Music is associated with the loss of a loved one, a failed love, grief, struggle over the disease. Music is dramatic, sad, nostalgic, touching, melancholic, despair, emotional, sadness, tragic, thoughtful, calm, dreary, soft, mellow, sentimental. This track is perfect for dramatic films, television, documentaries, advertising, commercials, podcasts, for sad projects, YouTube videos and more. Music very good technical and aesthetic quality. Instruments: piano, strings, violin, bass. (Full Track) Very sad, emotional, touching and dramatic playing piano. Music is dramatic, emotional, sad, dreamy, dreary, melancholy, intense, nostalgia, peaceful, quiet, sentimental. This track is perfect for your projects: for films, documentaries, advertising, commercials, podcasts, sad for projects, YouTube videos and more. Music very good technical and aesthetic quality. Buy Now for $119 Have a Discount Coupon?